Scientists think that the existence of this world could explain the strange looping of the trans-Neptunian objects or TNOs at the edge of the star system. Unfortunately, no telescope has so far been able to spot this elusive world. California Institute of Technology astronomer Michael Brown said there is a reason to believe that if the ninth planet does exist, it could be essentially invisible to existing observatories. In 2016, Brown and colleague Konstantin Batygin predicted that Planet Nine weighs five to 20 times more than the Earth’s mass and that it follows an elliptical orbit up to 1,000 times the distance between the Earth and the sun. Planets twice as far away as Earth appear 16 times dimmer since the intensity of sunlight weakens by a factor of four going out and by another four times coming back. This means that at an orbital distance of 600 astronomical units (AU), a body could be 160,000 dimmer than Neptune, which orbits 30 AU away from the sun. At 1,000 AU, the elusive Planet Nine would appear more than a million times weaker. 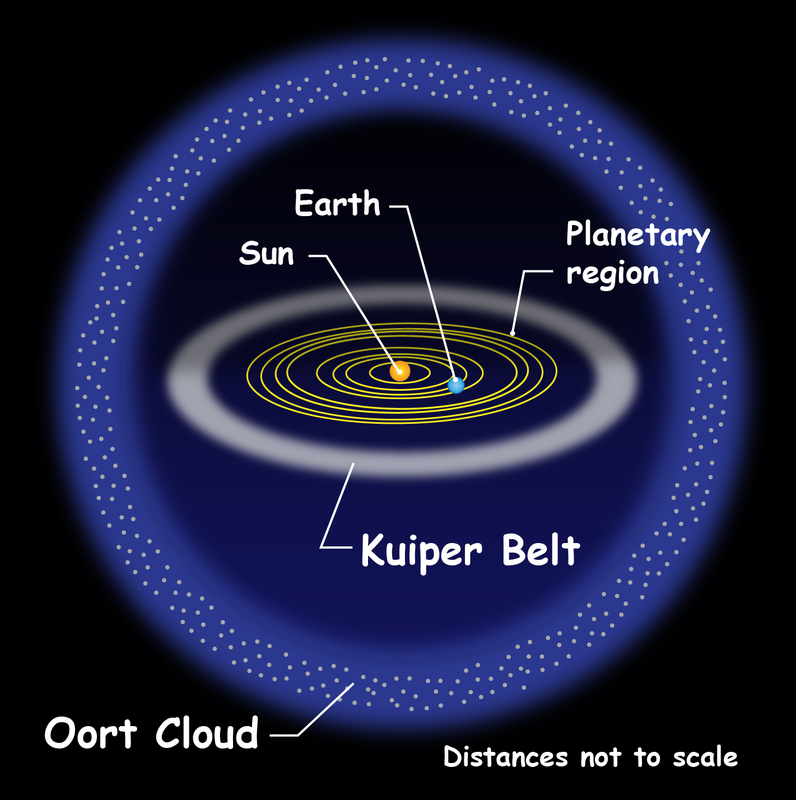 Talkshop note: ‘The Oort cloud, named after the Dutch astronomer Jan Oort, sometimes called the Öpik–Oort cloud, is a theoretical cloud of predominantly icy planetesimals proposed to surround the Sun at distances ranging from 50,000 to 200,000 AU (0.8 to 3.2 ly)’ – Wikipedia. That almost reads like a prologue to a 1930s SF story. Back in my youth I used to haunt second-hand book shops because they were a source of pulp SF books. I have vague memories of reading a story about an invisible planet that returning explorers couldn’t see but could hear the radio broadcasts.. These objects lie outside an apparently nearly empty gap in the Solar System starting at about 50 AU, and have no significant interaction with the planets. — These objects could have had their orbits and perihelion distances “lifted” by the passage of a nearby star when the Sun was still embedded in its birth star cluster. — Their orbits could have been disrupted by an as-yet-unknown planet-sized body beyond the Kuiper belt such as the hypothesized Planet Nine. — They could have been captured from around passing stars, most likely in the Sun’s birth cluster. It does raise the question of could something like that be applied to the missing object, but then we mustn’t upset too many suppositions. There are links to two short audio clips from Tesla’s receiver on page 24 of the pdf.